I spent some time in Paris. Monsier Montespan by Jean Teulé – An interesting book. A very different take on French history. A great book for somebody, but not really the book for me. 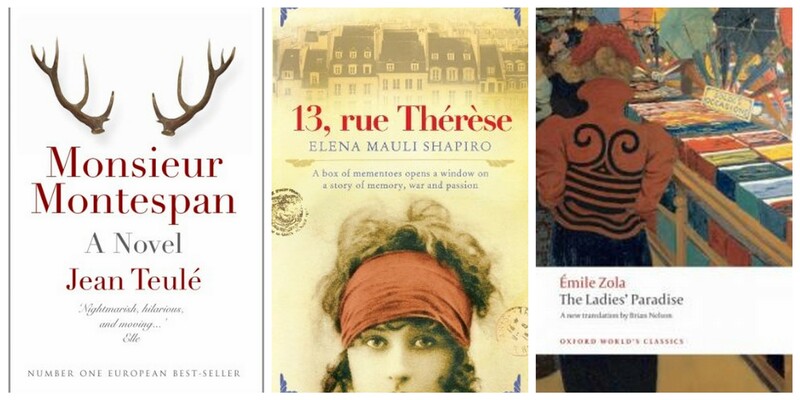 13, rue Thérèse by Elena Mauli Shapiro: Not the book I expected, but something much more interesting. And utterly intriguing. The Ladies’ Paradise by Émile Zola: The book for which the expression flawed but fabulous was invented. I’m still pondering which Zola to read next. From Charlotte Gainsbourg, from Novelle Vague, and from Françoise Hardy. But I didn’t spend as much time in Paris as I had intended. I was distracted by Orange July. Jamrach’s Menagerie by Carol Birch – I picked this one up and put it down a few times before I made it through. A great book, but definitely a book that needs the right moment. The Invisible Bridge by Julie Orringer – I’ve been progressing slowly through this one, and I have to say that it is quite wonderful. A Visit From The Goon Squad by Jennifer Egan – It was love, quite against my expectations. There were other books too. I can’t read to plan too much, I have to read the books that call. The Crime Fiction Alphabet came to an end. But now it’s August – my month for getting organised! I’ve already boxed up all of my outgoing books and put them on ReadItSwapIt and I’ve reorganised my bookcase of Virago Modern Classics and made sure they are all recorded on LibraryThing. Bibliotherapy can come in many different forms! I read five or six books about France in July and I’m terrible, I’ve hardly posted about any of them! I also checked out many, many French movies from the library, and I still haven’t watched them. Le sigh. But I’ve eaten more than my share of pate and French cheese! And French Fries! I think i spent too much time planning and wondering, and not enough reading and posting. It was fun though! I found it very readable, Margaret. But every book has its moment, and none of us can read everything. I just love your French books selection, all ones that I have been promising myself to read, but have never got around to. I wasn’t quite so sure about the Orange July selection, particularly ‘Jemrach’s Menagerie’, although I am open to trying anything new. I have also seen several bloggers, posting about The Crime Fiction Alphabet and wished I had noticed it a little earlier, as crime fiction is one of my favourite genres. I have also never joined ‘Readitswapit’, although I did consider joining ‘Bookcrossing’ at one time, but there didn’t seem to be a lot of take-up for it, here in the UK. Mind you, I have quite a network of family and friends, who will quite happily take books from me and any that have done the rounds, generally find their way into the charity shop where I volunteer. My French books were all very readable. The Orange books maybe a little less so, but they all had something to recommend them, and I like to keep things varied. I wouldn’t be at all surprised if Kerrie runs the Crime Fiction Alphabet again next year Yvonne. The advantage of RISI, over similar sites, is that you never send out a book without getting one back, but sometimes it’s infuriating when things don’t match up. I tend to put books on for a while to see if I can do a swap, and if they don’t go I take them off my list and give them to a charity shop or a library sale. Of course if you can find good homes for books locally it does save the postage.